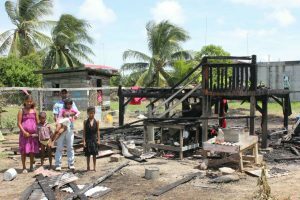 A Tain, Corentyne father of five and his five months pregnant wife are now homeless after their two-story wooden home was gutted by fire on Wednesday at about 1:00 pm. Thirty-one year-old Mulchand Ragbeer called ‘Ravi’ of Lot 120 Block ‘4’ Tain Settlement, Corentyne relayed to Demerara Waves Online he that on Wednesday at around noon, he left home after lunch, secured the house and left for work. Ragabeer stated that his neighbour disclosed that moments after he saw smoke emanating from the home, a man by the name of ‘Junie’ was seen walking down the stairs. Confirming that he knew the alleged arsonist, Ragabeer said that the man (Junie) and him were friends but had a disagreement. He noted that the man would usually visit the home even when he is not there. The man further noted that on Tuesday, ‘Junie’ entered the yard and attempted to break into his home but he was reportedly unsuccessful. This, he posited could be why the man would try to torch his home. The owners of the home reside overseas. Ragbeer stated that the house had no electricity and was fully furnished with necessary household amenities. He estimated over GYD$300,000 in losses. Meanwhile, police are currently hunting for the suspected arsonist who is on the run as investigations continue.